It took six games for both teams, and they're only functioning on a days rest, but the Washington Wizards are up next on the Boston Celtics radar, and it's gonna be fun! You thought the first round Chicago Bulls series was chippy? There was about as much conflict in that playoff series as there was between the Wizards and the C's during the regular season. 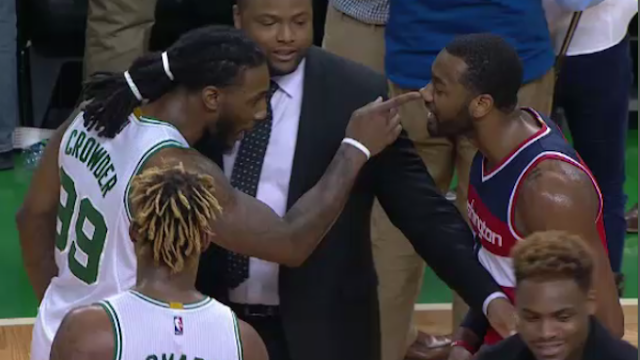 Remember the classic post-game scuffle between John Wall and Jae Crowder, the Wizards wearing all black to a regular season game, and some statement games from both teams during their four meetings? It's all pointing to the unexpected buddings of a new Eastern conference rivalry and what better place to cement that rivalry than in the playoffs. Does that mean it's going to get wild? Probably, yeah. So! Let's get right into it. Otto Porter is on the wing, having a career season, especially from behind the three point arc. The Georgetown product posted 43.4% from deep during the regular season, but isn't known as the best defender. Markieff Morris and Marcin Gortat make up the front court, each having a relatively quiet postseason. Gortat is still pulling down more than 10 rebounds per game, though, along with Morris' 11.2 PPG. Notable bench guys are Bojan Bogdonovic, who the Wizards picked up from the Brooklyn Nets at the trade deadline, and Kelly Oubre, who's in his second year with Washington. Oubre hasn't seen a ton of minutes though so far in the playoffs. That brings us to the keys of the series, first being depth. The Wizards don't really know what depth means. Brandon Jennings is Wall's backup, and there's a ton of players behind Beal, but nobody besides the starters and Bogdonovic are getting serious minutes. In fact, Wall and Beal are the only teammates to fall in the top ten in minutes played so far this postseason, both with 38+ minutes per game. For comparison, the highest Celtic is Avery Bradley who's 24th with 36, and next is Isaiah Thomas with a little more than 34. Depth rarely determines a playoff series because most teams go to a shortened rotation, but Boston could beat Washington on depth alone. The other key of the series will be rebounding. During the regular season, the Wizards crushed the C's on the glass, out-rebounding Boston 180-161 over the course of the season series. Head coach Brad Stevens may have found a solution to the rebounding woes during the Bulls series by starting Gerald Green and forcing the center out of the paint, but it hasn't been proven yet against the Wizards. While Ian Mahinmi remains sidelined with a nagging calf injury, the Wizards have no one to turn to at the five outside of Gortat. If he gets into foul trouble early on, Washington will have to play smaller than they'd like, and lose almost all of their presence on the boards. The toughest challenge the C's will face will be bottling up John Wall. The point guard had a phenomenal series against the Atlanta Hawks, averaging a double-double on 52.5% shooting and an unreal 47.4% from three. Boston's perimeter defenders should be able to drop those numbers, but it's nearly impossible to silence a star like John Wall. If the Celtics can lock him down, it will strip the Wizards of the core of their offensive game. Expect a gritty, hard-fought series from both sides. The last time the Celtics were in the nations capitol during the playoffs, it turned ugly and while there may not be another brawl, trash talk will be constant, tensions will be high, and another dust-up definitely isn't out of the realm of possibility. One thing that's for sure? It's going to be an awesome series. Follow Topher Lane on Twitter, @Topher_L. Photo credit: CSNNE.